•	The depression in the scalp (or skin) that envelopes or surrounds the hair. 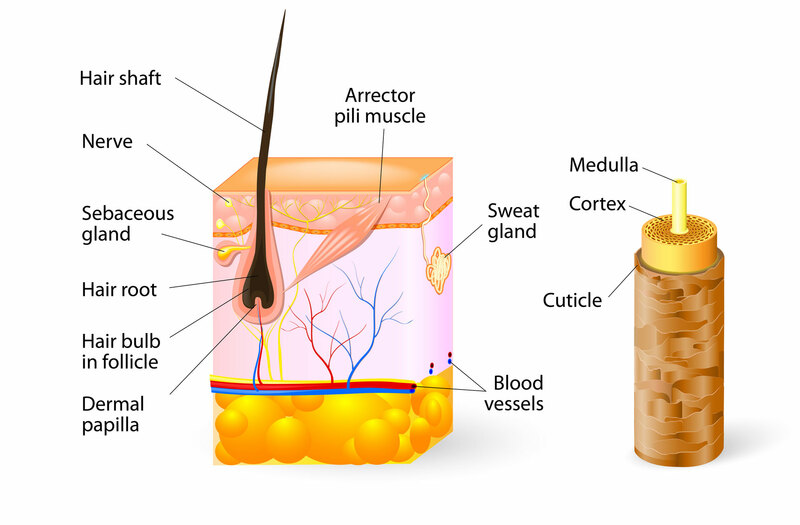 •	One or more oil glands are attached to each follicle. •	Set on a slight angle. •	The bottom portion of the hair (the base). •	Fits onto the papilla. •	The blood and nerve supply to the hair root. •	If the papilla is damaged, hair will stop growing. The strand portion of the hair is found above the skin surface and is a simple structure composed of keratin, a strong fibrous protein. This is the same kind of protein that makes up the nails and the outer layer of skin. Each strand of hair consists of three layers, an innermost layer or medulla which is only present in large thick hairs. The middle layer known as the cortex, it provides strength, colour and texture to the hair, and the outermost layer which is known as the cuticle. The cuticle is thin and colourless and serves as a protector of the cortex.